Samsung Galaxy Note is the biggest phone we are having right now. LG announced its Optimus Vu earlier and said that it is having the 5 inch display. It is smaller than the 5.3 inches of Samsung Galaxy Note display. But now an image of LG Optimus Vu and Samsung Galaxy Note together is out which shows the difference between these Android smartphones. 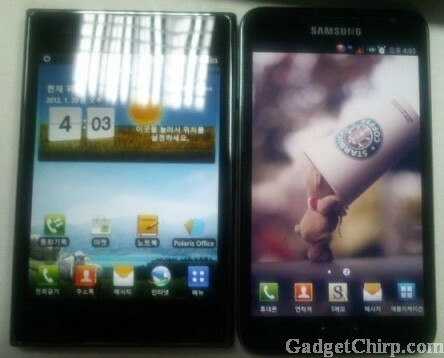 As we can see in the image above, LG Optimus Vu is a bit smaller than Samsung Galaxy Note in length but it is more in width. And that is why, it is looking much bigger than the Samsung Galaxy Note. As it is rumored, LG Optimus Vu will have the 1.5GHz dual-core Qualcomm processor, 1GB RAM, 8GB internal storage, NFC, 8 megapixel camera and Android 2.3 Gingerbread which will be upgradeable to Android 4.0 Ice Cream Sandwich in the future.